I planted a flat each of tomatoes and hot peppers today. They’ll go under our microgreen grow lights and eventually be transferred into the greenhouse when they outgrow their indoor space. As soon as I locate our peat pots, I’ll plant a ton of pickling cucumbers. 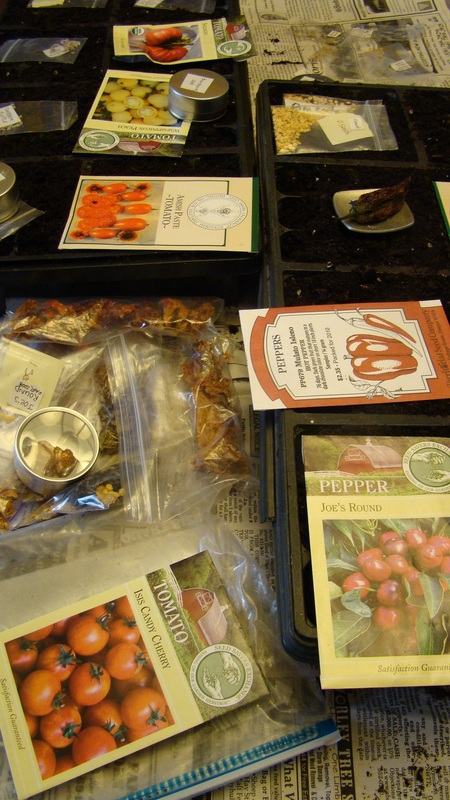 I went through all of our seeds today and have laid out 8 different planting dates from now until early June to get everything in the ground that we want to grow this year. Zucchini, rutabagas, peas, sunflowers, radishes, lettuce, spinach, soybeans, carrots and many many varieties of pumpkins (a gal can hope) are a few things set aside. I just can’t bring myself to plant beans again. The deer ALWAYS break in and eat them.